The Ullswater 'Steamers' cruise on Ullswater Lake situated in the north of the county and only a short drive from Penrith. Ullswater has some of the best scenery in Lakeland and has drawn comparisons to the impressive Lake Lucerne. Miles of bridleways and footpaths link to Steamer routes, incorporating some of the famous and spectacular routes such as the Howtown Lakeshore walk, Aira Force and Hallin Fell, to name a few. 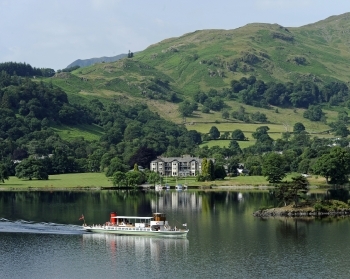 The Steamers have sailed on Ullswater since the late 1800s and still use two of the original vessels today. Lady of the Lake, launched in the 1880s, is one of the oldest working passenger vessels in the world. Ullswater is a place rich in history; believed to be part of Arthurian legend its rugged hills were once home to the Romans who resided in Cumbria for many years. On the water, records were broken as Donald Campbell smashed the world speed record in his Bluebird K7 craft, clocking up an impressive 200mph over the middle mile. By the shore those famous daffodils still bloom in the Spring immortalised in the famous poem by William Wordsworth. With so much to see and take in there's no better time to make a trip to Ullswater. Sit back and relax as we take you on a journey through one of the Lake District's hidden gems. Four piers with cruises ranging from 20 minutes to over two hours. Best value Sail all Day option, hop on/off as many times as you like.